Bab - A gate into the Medina. 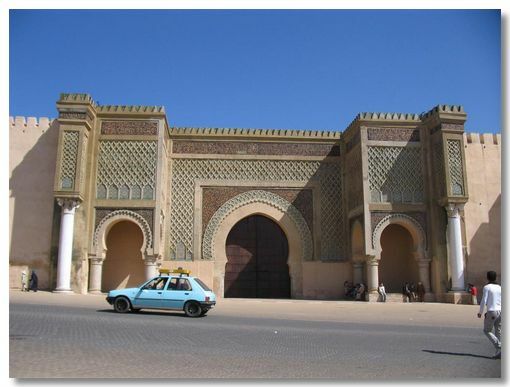 For defensive purposes the Medina walls had only a limited number of entrance gates which were heavily fortified. 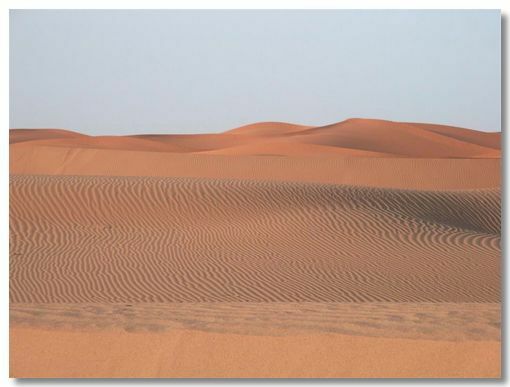 Erg - Desert area with large sand dunes. 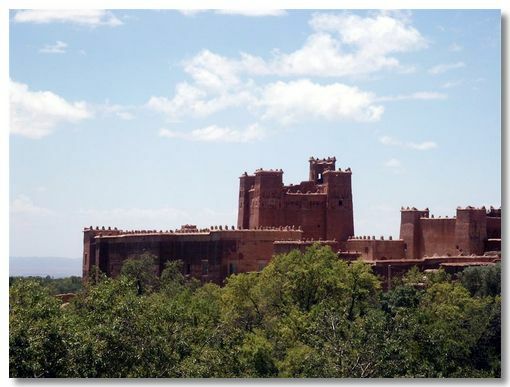 Kasbah / Ksar - Kasbahs are old citadels or fortified houses and Ksars are old fortified Berber villages. Both words seem to be interchangeable. They look like square medieval castles with high crenellated walls and turrets on the four corners. Magnificent! Madrasa - A school. The Islamic culture has a long tradition of fostering academic study. Many of the madrasas we saw were many hundreds of years old, well kept and often still in use. Medina - The older area of a city with traditional Arabic dwellings, Mosques, etc. surrounded by defensive walls. Many cities are clearly divided between the Medina and the modern Ville Nouvelle areas with their French colonial influences. 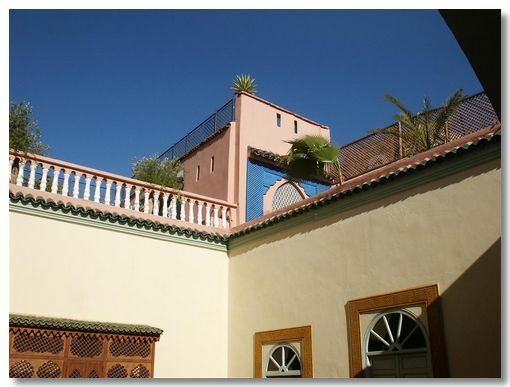 Riad - A private house built round a courtyard, often with a fountain in the middle. To protect the privacy of the inhabitants from the outside world, all the surrounding rooms have windows only opening inwards on to the courtyard, unlike ordinary houses where the windows open outwards. Souq - A market. An area with small shops typically grouped by trade. No prices are displayed. If you ask the price of anything the expectation is that a purchase must then be concluded - usually after a lot of haggling. Wadi - A dried up river bed which only contains water during times of occasional heavy rain. 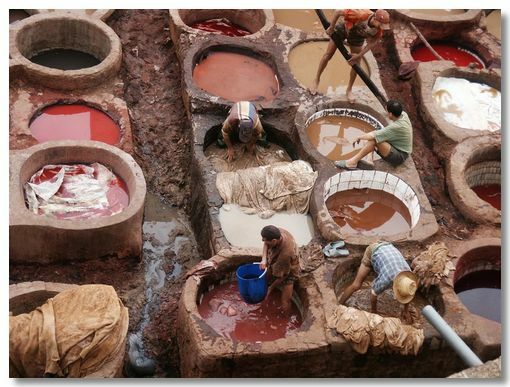 Unfortunately Wadis are becoming more common resulting in a negative impact on the local communities. 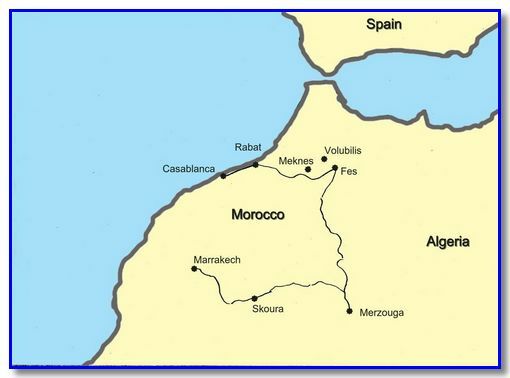 In May 2008 Ann & I embarked on our Moroccan adventure - but not quite as first planned. We had originally booked a group tour taking the option to purchase the flights separately on the advice of the Travel Company (much cheaper that way). Then with little more than 2 months notice the Travel Company cancelled the trip. So we were left with the return flights already paid for & having to start again to create our own holiday. Luckily with a bit of effort we managed to quickly put together an itinerary with the help of Naturally Morocco. We flew into Casablanca and were taken straight to Rabat for an overnight stay followed by a train journey to Fes, which was our base for exploring the city & the surroundings, including another Imperial city, Meknes and the extensive Roman remains at Volubilis. On leaving Fes we hired a car to drive south to Merzouga on the edge of the Sahara. Next we drove to Skoura at the foothills of the Atlas mountains. A great place for excursions. 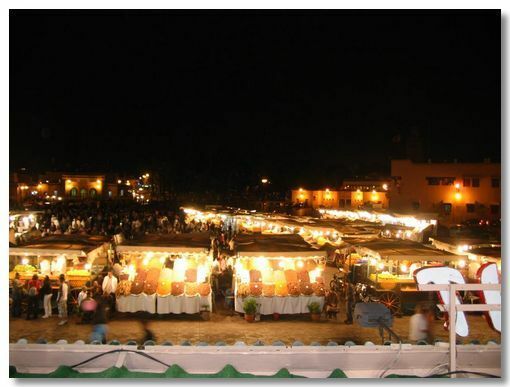 Finally we drove to Marrakech for a short stay before returning home. These web pages do not strictly follow our itinerary. Instead I start off with the "Imperial Cities" and then show sets of photos of our travelling south through Morocco, along with some pages on Souqs, Kasbahs & Riads. I give at the bottom of this page the meaning of some Arabic words, just in case you are unfamiliar with them. We loved Fes, but were disappointed with Marrakech. We only had fleeting visits to Rabat & Meknes which didn't really do them justice. 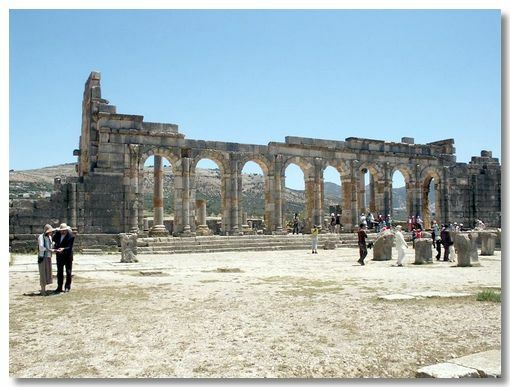 A short distance from Fes lie the remains of the Roman city of Volubilis. The setting in a fabulous wide plain is a photographer's dream. On the edge of the Sahara, this is where Moroccans holiday. Located in the foothills of the High Atlas mountains, Skoura is an ideal base for trekking and exploring the backwaters of Morocco, unspoilt (as yet) by tourism. 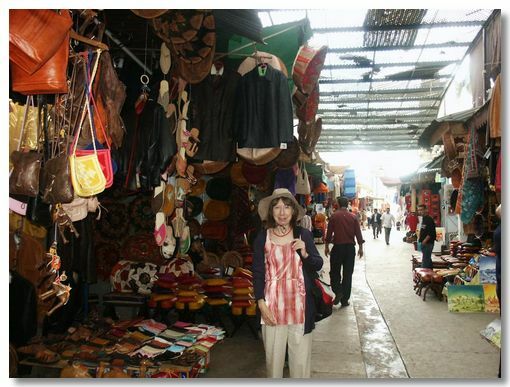 Well we could hardly avoid shopping in the Souqs, including the world's largest one in Fes. 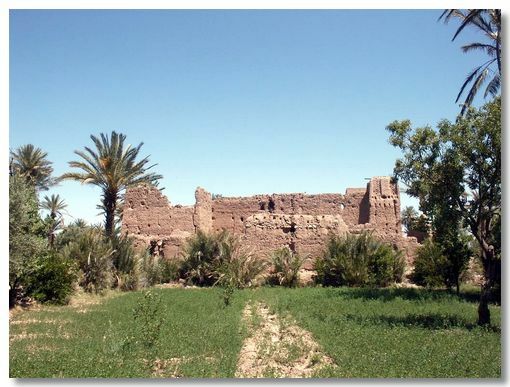 Kasbahs & Ksars are the old fortified houses & villages. Built of mud & straw, the designs are unchanged from medieval days. Very romantic & inspiring. A Riad is simply a house with a courtyard. About 30 years ago many Moroccans (& French expatriates) cashed-in on the original tourist boom by promoting them as a "traditional" trendy alternative to large hotels. All the Riads we stayed in were most charming & delightful with superb food. 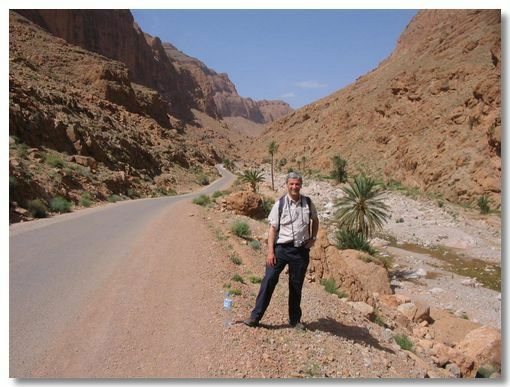 Morocco is a rugged barren country. The people are open and friendly - particularly if they are trying to sell you something.